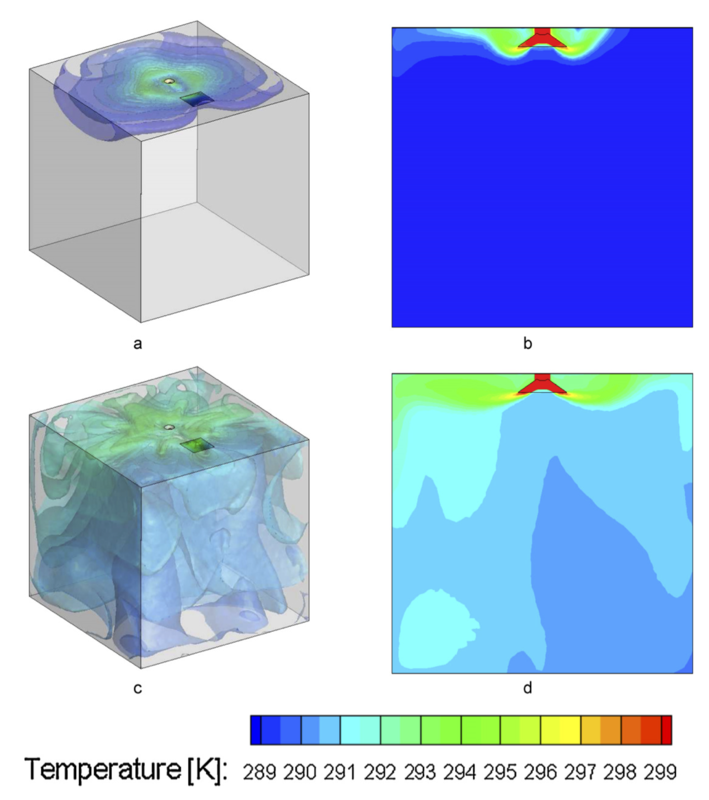 Computational Fluid Dynamics (CFD) simulations are an excellent tool to obtain spatially resolved thermal comfort metrics along with energy performance metrics. 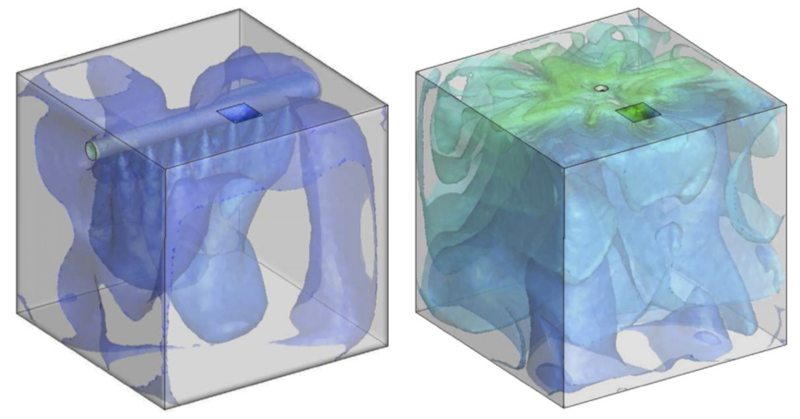 One of the most challenging aspects of running CFD simulations is creating the geometry and a discretization that resolves all the important physics in the space. Often times the geometry of a building is extremely complicated and the differences in length scales from the length/width/height of the building to the size of the diffuser inlets can be very large. This large difference in length scales results in large computational cost to simulate these buildings. Fig. 1: Linear air dispersion ductwork system model: 3D steady state CFD simulation encompassing 36.5 M elements solved on 2,048 processors. 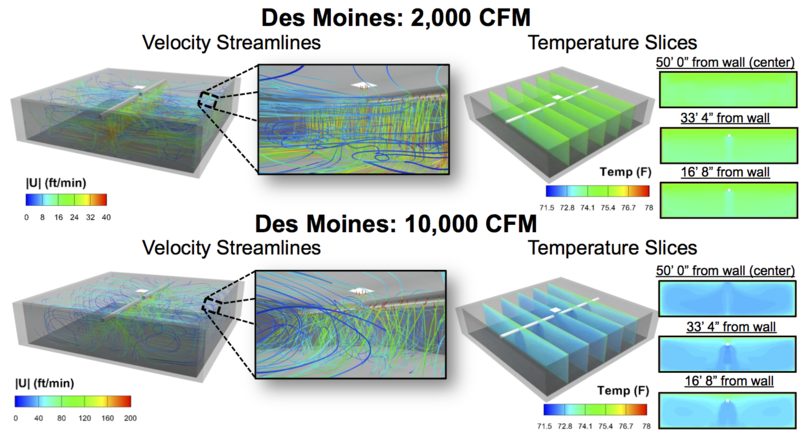 In this group we have utilized HPC resources to simulate building ventilations systems. The itemized list below is the size of the problems we have worked on for many different projects. 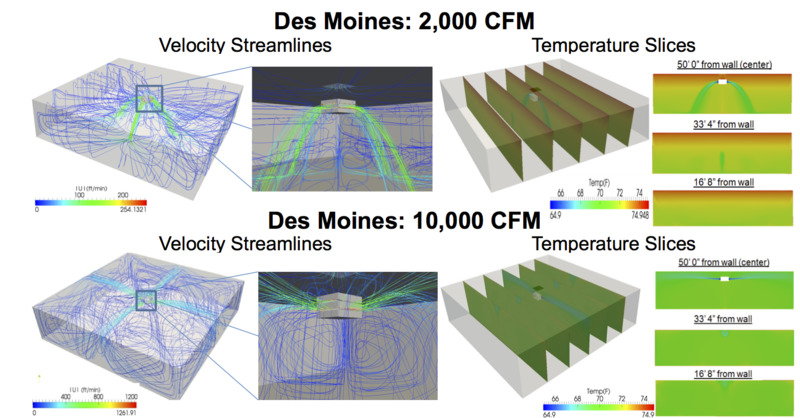 The results have aided in the designs of linear air dispersion ductwork systems, provide a comparative result of the performance differences between throw diffusers and linear dispersion ductwork systems, and the evaluation of the thermal comfort of these systems in both small office spaces and large open commercial buildings. The air distribution mechanism often determines how effectively the space is heated or cooled and also how comfortable the space will be for the occupants in these spaces. Four-way throw diffusers main mechanism is to throw air around the edges of the space while maintaining lower air speeds and temperature gradients in occupied space. The main mechanism for linear air dispersion systems is to deploy fresh air through out the space in the areas in which fresh air is needed the most. The performance of these two systems are compared for both comfort and efficiency in different scenarios. The systems were compared in a 64 ft2 small office space during winter conditions. The performance metrics under investigations were Air Diffusion Performance Index (ADPI), mean temperature and air speed in the occupied space, standard deviation in the occupied space, and energy absorbed by the space for different air speeds. The second comparison was for a much larger 10,000 ft2 commercial building during summer conditions. The performance metrics under investigation were the same as the small office with the exception of the heat flow values into the building from the envelope under peak conditions were also calculated for the larger building. The performance (both energy and thermal comfort) was evaluated in multiple geographic locations. Fontanini, M.G. Olsen, B. Ganapathysubramanian, “Green Building Duct Systems: Thermal comparison between ceiling diffusers and fabric ductwork products”, Energy and Buildings, 2011, 43, pg. 2973 – 2987. Fontanini, A. Passalacqua, U. Vaidya, M.G. Olsen, B. Ganapathysubramanian, “High-Resolution Performance Analysis of a Large Building with Linear Dispersion Ductwork System,”ASHRAE Transactions, New York, 2014.